Geriatrics, or geriatric medicine, is a specialty that focuses on health care of elderly people. It aims to promote health by preventing and treating diseases and disabilities in older adults. There is no set age at which patients may be under the care of a geriatrician, or geriatric physician, a physician who specializes in the care of elderly people. Rather, this decision is determined by the individual patient's needs, and the availability of a specialist. It is important to note the difference between geriatrics, the care of aged people, and gerontology, which is the study of the aging process itself. The term geriatrics comes from the Greek γέρων geron meaning "old man", and ιατρός iatros meaning "healer". 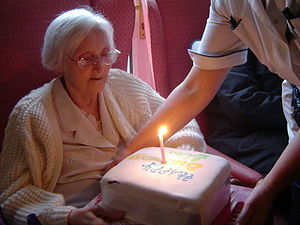 However, geriatrics is sometimes called medical gerontology. Geriatricians distinguish between diseases and the effects of normal aging. For example, renal impairment may be a part of aging, but renal failure and urinary incontinence are not. Geriatricians aim to treat diseases that are present and achieve healthy aging. Geriatricians focus on achieving the patient's highest priorities in the context of multiple chronic conditions, and on preserving function. One of the eight branches of the traditional Indian system of medicine, Ayurveda, is jara or rasayana, similar to geriatrics. Charaka described the fatigue and physical exhaustion caused by premature aging as the result of a poor diet. The Charaka Samhita recommends that elderly patients avoid excessive physical or mental strain and consume a light but nutritious diet. A number of physicians in the Byzantine Empire studied geriatrics, with doctors like Aëtius of Amida evidently specializing in the field. Alexander of Tralles viewed the process of aging as a natural and inevitable form of marasmus, caused by the loss of moisture in body tissue. The works of Aëtius describe the mental and physical symptoms of aging. Theophilus Protospatharius and Joannes Actuarius also discussed the topic in their medical works. Byzantine physicians typically drew on the works of Oribasius and recommended that elderly patients consume a diet rich in foods that provide "heat and moisture". They also recommended frequent bathing, massaging, rest, and low-intensity exercise regimens. In The Canon of Medicine, written by Avicenna in 1025, the author was concerned with how "old folk need plenty of sleep" and how their bodies should be anointed with oil, and recommended exercises such as walking or horse-riding. Thesis III of the Canon discussed the diet suitable for old people, and dedicated several sections to elderly patients who become constipated. The Arab physician Algizar (circa 898–980) wrote a book on the medicine and health of the elderly. He also wrote a book on sleep disorders and another one on forgetfulness and how to strengthen memory, and a treatise on causes of mortality. [dead link] Another Arab physician in the 9th century, Ishaq ibn Hunayn (died 910), the son of Nestorian Christian scholar Hunayn Ibn Ishaq, wrote a Treatise on Drugs for Forgetfulness. Another innovator of British geriatrics is Bernard Isaacs, who described the "giants" of geriatrics mentioned above: immobility and instability, incontinence, and impaired intellect. Isaacs asserted that, if examined closely enough, all common problems with older people relate to one or more of these giants. Doctors of Medicine (M.D.) can complete a three-year core internal medicine residency program, followed by two years of specialized geriatrics residency training. This pathway leads to certification, and possibly fellowship after several years of supplementary academic training, by the Royal College of Physicians and Surgeons of Canada. Doctors of Medicine can opt for a two-year residency program in family medicine and complete a one-year enhanced skills program in care of the elderly. This post-doctoral pathway is accredited by the College of Family Physicians of Canada. Elder abuse occurs increasingly when caregivers of elderly relatives suffer from mental illness. These instances of abuse can be prevented by engaging these individuals with mental illness in mental health treatment. Additionally, interventions aimed at decreasing elder reliance on relatives may help decrease conflict and abuse. Family education and support programs conducted by mental health professionals may also be beneficial for elderly patients to learn how to set limits with relatives with psychiatric disorders without causing conflict that leads to abuse. ^ "Definition of Geriatric medicine". MedicineNet. ^ Fletcher C; Peto R (1977). "The natural history of chronic airflow obstruction". Br Med J. 1 (6077): 1645–8. doi:10.1136/bmj.1.6077.1645. PMC 1607732. PMID 871704. ^ Qato, DM; Alexander GC; Conti RM; Johnson M; Schumm P; Lindau ST (24 December 2008). "Use of prescription and over-the-counter medications and dietary supplements among older adults in the United States". JAMA. 300 (24): 2867–2878. doi:10.1001/jama.2008.892. PMC 2702513. PMID 19109115. Retrieved 2011-11-11. ^ "GERIATRICSFOR-SPECIALISTS INITIATIVE (GSI)" (PDF). Archived from the original (PDF) on 25 March 2009. Retrieved 9 February 2016. ^ "Increasing Geriatrics Expertise in Surgical and Medical Specialties" (PDF). Archived from the original (PDF) on 25 March 2009. Retrieved 9 February 2016. ^ Durgawati Devi; Rajeev Srivastava; B. K. Dwivedi (2010). "A critical review of concept of aging in Ayurveda". Ayu. 31 (4): 516–9. doi:10.4103/0974-8520.82030. PMC 3202253. PMID 22048551. ^ Lascaratos, J.; Poulacou-Rebelacou, E. (2000). "The roots of geriatric medicine: Care of the aged in Byzantine times (324-1453 AD)". Gerontology. 46 (1): 2–6. doi:10.1159/000022125. PMID 11111221. ^ Howell, Trevor H. (January 1987). "Avicenna and His Regimen of Old Age". Age and Ageing. 16 (1): 58–9. doi:10.1093/ageing/16.1.58. PMID 3551552. ^ Howell TH (1972). "Avicenna and the care of the aged". Gerontologist. 12 (4): 424–6. doi:10.1093/geront/12.4.424. PMID 4569393. ^ Pitskhelauri GZ; Dzhorbenadze DA (1970). "Gerontology and geriatrics in the works of Abu Ali Ibn Sina (Avicenna) (on the 950th anniversary of the manuscript, Canon of Medical Science)". Sov Zdravookhr (in Russian). 29 (10): 68–71. PMID 4931547. ^ "Islamic Culture and the Medical Arts: Specialized Literature". www.nlm.nih.gov. ^ a b "History of the development of geriatric medicine in the UK"
^ "Nascher/Manning Award". Archived from the original on 20 October 2012. Retrieved 1 November 2012. ^ Achenbaum, W. Andrew; Albert, Daniel M. (1995). "Ignatz Leo Nascher". Profiles in Gerontology: A Biographical Dictionary. Greenwood. p. 256. ISBN 9780313292743. ^ Denham MJ. Dr Marjory Warren CBE MRCS LRCP (1897-1960): the mother of British geriatric medicine. J Med Biogr 2011;19:105-10. ^ "A giant of geriatric medicine - Professor Bernard Isaacs (1924-1995)". British Geriatrics Society. Retrieved 23 October 2018. ^ "Department of Health Older People's information". ^ Barton A; Mulley G (April 2003). "History of the development of geriatric medicine in the UK". Postgrad Med J. 79 (930): 229–34, quiz 233–4. doi:10.1136/pmj.79.930.229. PMC 1742667. PMID 12743345. ^ "The John A. Hartford Foundation". www.jhartfound.org. This page was last edited on 22 March 2019, at 13:47 (UTC).